Imagine reclining under a palapa, perhaps running a foot through the soft sand while sipping on a frozen cocktail and staring out at the horizon where blue skies and crystal-clear waters meet. Or, perhaps consider walking down a narrow cobblestone street, surrounded by short buildings painted in vibrant colours, and coming across a small festival where locals are playing lively music. Melia Hotels International Cuba and Sunwing can help bring those images to life, as travellers have seven different destinations throughout Cuba to choose from, such as the white-sand beaches of Varadero, or the richly historical and colourful capital of Havana—offering something for everyone, including families, couples, and anyone in between. From elegant adults-only options to activity-packed family-friendly resorts, Sunwing makes travelling to these unique Cuban experiences even easier as it offers daily flights to many of these tropical oases within Cuba. 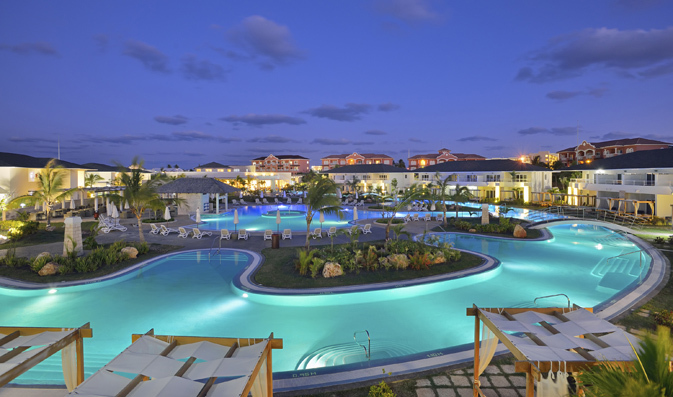 Melia has several properties across Cuba that cater to all types of families, as well as a variety of activities to keep multiple generations happy. At Sol Palmeras in Varadero, families can feel right at home in their very own bungalow, and enjoy a host of amenities designed for all ages. During the day, kids can join the Cubamigos Club for lots of supervised activities, while adults can enjoy some downtime enjoy a quiet dinner for two at one of the resort’s restaurants. Paradisus Varadero is well-recognized for exuding Cuba’s natural beauty, and is just a short walk from Varahicacos Ecological Reserve which offers lots of beautiful trails to explore and ancient caves covered with pre-Columbian paintings. At this 5-start resort, families will enjoy the perfect combination of luxury and entertainment in the Family Concierge section; with a baby, mini, and teen club offer tons of supervised activities, varied gourmet dining options, and unique experiences such as mother and daughter packages at the beautiful Yhi Spa. Offering the best of both worlds for kids and adults, Melia Las Dunas located on the beautiful beach of Cayo Santa Maria has facilities just for the kids and parents. Families can spend their days building sand castles and visiting the ice cream parlour for a sweet treat, maybe taking a dip in the pool, or take advantage of the many land and water sports available. Melia Hotels in Cuba are designed to offer all types of travellers plenty of activities designed to ensure they can make the most of their vacation. For a mix of day and evening entertainment, Sol Cayo Guillermo is an ideal choice as it offers an array of land and water activities including diving and fishing; and in the evening guests can enjoy entertaining performances after enjoying a hearty meal at their choice of restaurant. From salsa lessons to beach volleyball, Melia Jardines del Rey in Cayo Coco is a favourite resort for its ability to cater to all types of travellers. Guests can relax on the gorgeous stretch of beach, splash away in one of the four sparkling pools, explore Cayo Coco’s shops and entertainment nearby, and enjoy a wide range of dining options. For guests who love nightlife, Melia Santiago de Cuba is right in the city centre, and the Santiago Café is the perfect place to dance the night away. Or, for a rich cultural experience, Melia Cohiba is nearby some of Havana’s most popular attractions, such as the art gallery featuring beautiful contemporary Cuban art. For a relaxing and sophisticated getaway, adults can enjoy the beautiful backdrop of spectacular white-sand beaches and lush green gardens at Melia Las Antillas in Varadero. Guests can also take advantage of a well-equipped fitness centre and beachside watersports, a piano bar that’s perfect for pre-dinner cocktails, a range of dining options from around the globe, and an on-site nightclub for unwinding. For a more upscale experience, beachgoers can soak up the sun and relax at Paradisus Princesa Del Mar, situated along the famous white-sand beach in Varadero. This property also offers lagoon-style swimming pools with hydro massage features, special swim-up suites exclusive to the Royal Service, and a spa with a range of therapeutic treatments. Or, Paradisus Rio De Oro Resort and Spa in Holguin features the sparkling waters of Playa Esmeralda where travellers can snorkel around the colourful coral reef. For travellers looking to add a bit of adventure into their vacation, Paradisus resorts in Cuba all offered included diving options such as introductory lessons. Whether travellers are looking for fun for the whole family or some adults-only relaxation, Melia Hotels International Cuba and Sunwing can help find the perfect fit for any visit to Cuba.